FR1SX turns your SCSI device into a FireWire(IEEE1394) device. The SCSI device works as a FireWire(IEEE1394) device seamlessly. Turn your SCSI device into a FireWire(IEEE1394) device. - Quick and easy Plug-and-play installation. 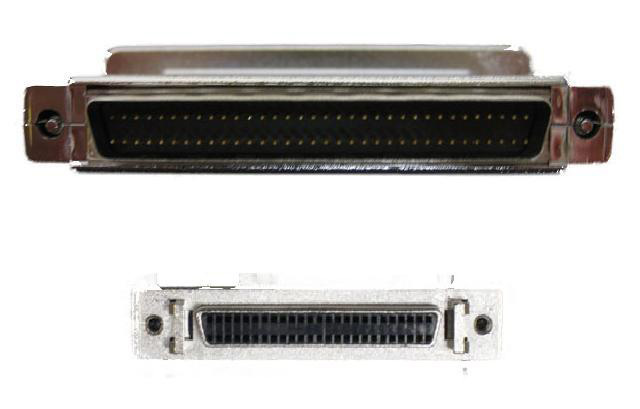 Attach the FR1SX to SCSI device, then connect the FR1SX to your Mac or Windows PC with FireWire(IEEE1394) Cable. Enables you to handle a SCSI device as a FireWire(IEEE1394) device. - Two FireWire(IEEE1394) 400Mbps ports(6-pin) are available. - IEEE1394a fully compliant PHY-Link is included. - Supports SBP2 ORB/CDB command set. - Works as a SCSI initiator. Supports high-speed, high-performance Ultra SCSI. Supports up to 20MB/sec data transfer. Compatible with various SCSI devices. 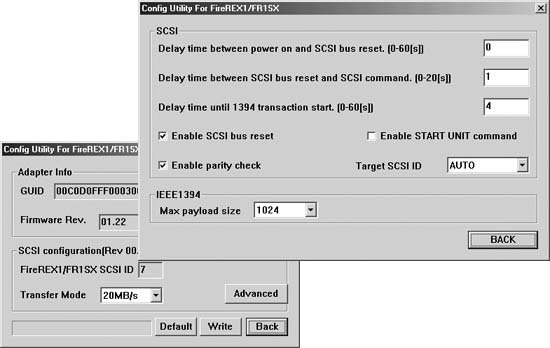 *Some legacy device may require unique SCSI bus parameter, in the case, refer the "FR1SX Configuration Utility" just below. You don't need to install the specific driver for FR1SX. FR1SX is fully compatible with Mac OS 9.x, Mac OS X 10.x Apple FireWire Standard drivers and SBP2 drivers. The SCSI device will be shown up at the System Profiler by just hooking up to FireWire port. 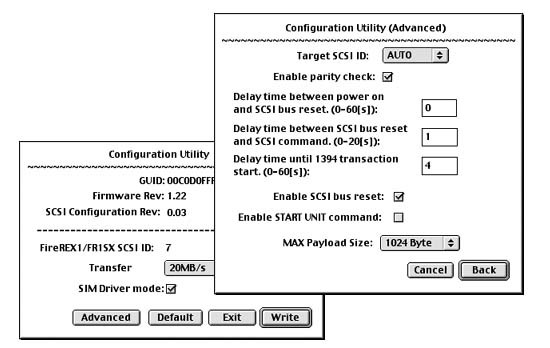 *If you want to use legacy SCSI device such as scanners, you need to change FR1SX configuration setting to adjust SCSI bus parameter by this Configuration Utility. 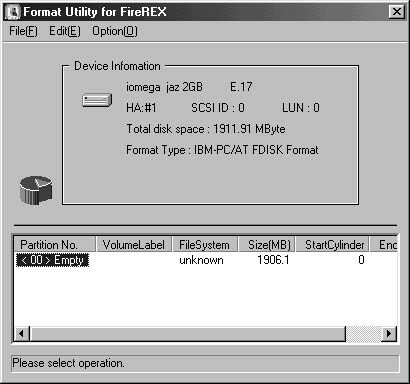 *Enables you to format the SCSI storage media through FR1SX on Windows OS. FireWire(IEEE1394) enabled PowerMac, PowerBook, iMac, iBook, and Mac mini. MacOS X 10.1.x, 10.2.x ,10.3.x, 10.4.x and 10.5. *You need to install FR1SX SIM driver to use Applications based on SIM-API(SCSI Interface Module Application Interface on Mac OS 9.x). You can download it from our web page, after user registration. *Why do you need FR1SX SIM driver? 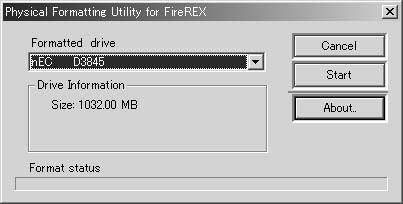 Mac OS 9 recognizes a SCSI device as a FireWire device, through FR1SX. But, if you want to use SIM-API based application, you need to make your device be mounted as a SCSI device. 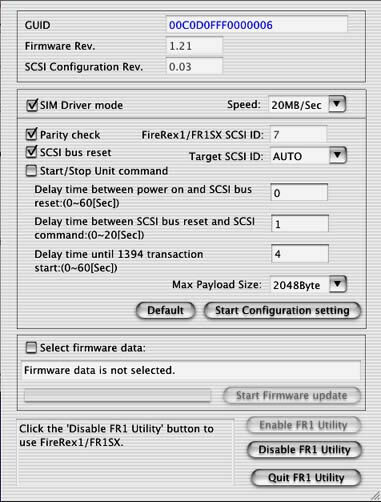 The FR1SX converts FireWire IO request to SCSI IO request and provide SIM-API to the application. The SCSI port is shown up at 'System Profiler' and the attached device is mounted as a SCSI device through FR1SX (See the left image). *FR1SX SIM driver only works on Mac OS 9.x. If you are using Mac OS X, you don't need SIM driver, and you can use Mac OS X applications listed below. - Vuescan 7 or later for Scanners and Film Scanners. - Roxio Toast 5 or later for DVD and CD Burner. - DANTZ Retrospect 5 or later for backup devices. IEEE1394 or i.Link enabled Windows PC. *Regarding Vista software, refer to Software Download Page. Windows 98SE (Windows update required). - TWAIN compatible application software for Scanners. - Roxio Easy CD Creator 5 or later for DVD and CD Burner. - DANTZ Retrospect desktop 5.6 (Win) for backup utilities. 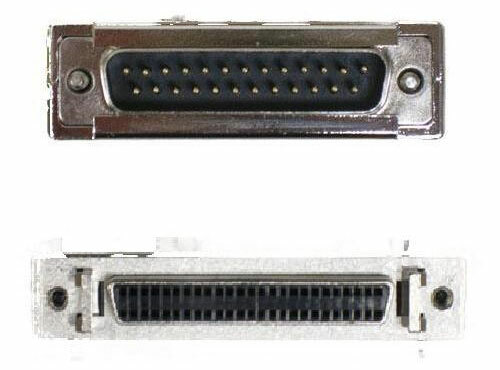 High-density 50P female SCSI-2 connector. 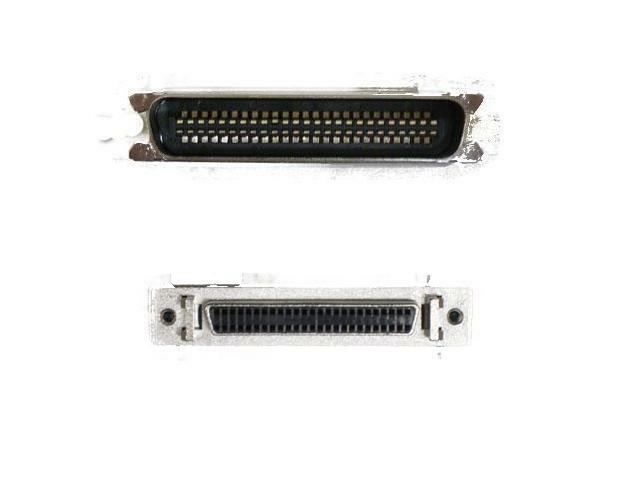 *For the SCSI-1 device with Centronics 50F connector, High-Density 50F to Centronics 50M adapter is available at RATOC Web Mall. *If the device does not support term power output, use Optional AC Adapter. Or you may use popular DC5V switching regulator type AC adapter. Please refer the Specification table below; for more detailed information about plug (power tip) and amperage. SCSI HD, Removable HD, IOMega Jaz, ORB, MO drives, CD-ROM drives, CD-Burners, DVD-ROM drives, DVD-burners, scanners, film scanners, Tape drives. Please refer the Compatible device lists for Windows and for Mac. *If the package doesn't include Vista Software CD-ROM, refer to Software Download Page.